Two-phase models are used for investigations of geotechnical problems in which the mechanical behaviour of soil is affected significantly by pore fluid. The field of application of the two-phase model is very versatile. The model can be used to calculate time dependent consolidation settlements of soil, or even for more complex issues, such as describe the phenomenon of soil liquefaction during an earthquake. Two phase mixture is assumed to consist of a solid phase, the skeleton, and a fluid phase which fully occupies the pores in the skeleton (Figure 1). The solid and fluid constituents are considered as compressible. The theory is based on Terzaghi’s effective stress principle and Biot’s extension for three dimensions. 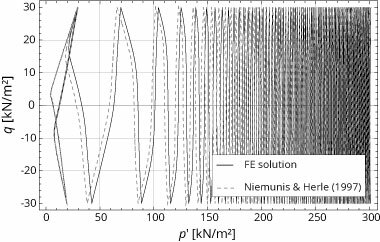 The governing equations of the coupled problem fluid flow – structural deformation are the equations of pore fluid flow and the equilibrium conditions. A stable 3-D continuum element u20p8 on the basis of the two-phase model is implemented as shown in Figure 2, where the displacement field is approximated using triquadratic interpolation functions and the pressure fields is approximated using trilinear interpolation functions. A high order interpolation of the displacement field is required to overcome unstable tendencies of the finite element. The finite element fully couples the solid and the fluid phase of the soil and allows the consideration of a nonlinear stress-strain relationship. In the following two numerical examples are presented to verify the two-phase model and implemented u20p8 element. The problem of the consolidation of a clay layer subjected to surface loads was investigated by Booker (1974). In his investigation it was assumed that the soil consists of an isotropic perfectly elastic skeleton saturated with water. 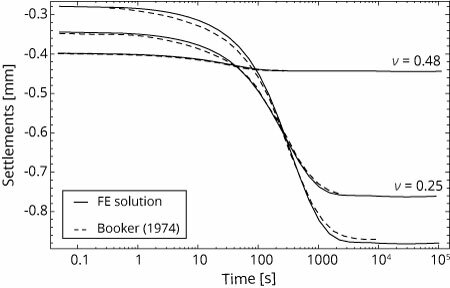 3-D simulations with u20p8 Elements were performed to compare these finite element results with Booker (1974). A fully water saturated clay layer resting on a rigid base, i.e. fixed boundary conditions, and subject to circular surface loading is modeled and shown in Figure 3. Due to the symmetric loading condition only a quarter of the system is considered. 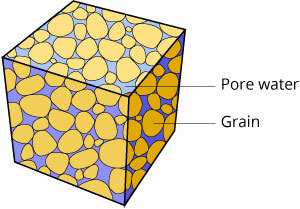 The model surface is assumed to be permeable. The parameters Young’s modulus E, Poisson’s ratio ν and the hydraulic conductivity k of clay layer are given in Table 1. The contours of pore water pressure at t = 0.5 s and t = 100 s for ν = 0.25 are shown in Figure 4. The results at the beginning of loading demonstrate that the load is carried by pore water, i.e. an excess pore water pressure is developed. The load is with increasing time transferred to solid phase, so that the excess pore water pressure is beginning to dissipate and the effective stress is increasing. The simulated time histories of settlements for ν = 0.0, 0.25 and 0.48 are shown in Figure 5. A comparison with the calculated results by Booker (1974) shows a good agreement. Cyclic undrained triaxial test with dense Hochstetten sand is simulated using an u20p8 element. The material behaviour of sand is described using a hypoplastic constitutive model with elastic range Niemunis & Herle (1998). It is capable of accounting both for the stress and density dependent mechanical behaviour of sand and the influence of cyclic loading as well. The simulation is performed for an initially isotropic pressure of p’= 300 kN/m² and a stress deviator amplitude of q = 30 kN/m². The results of numerical simulation are presented in Figure 6. A comparison with the numerical results by Niemunis & Herle (1998) shows a good agreement. The interaction behaviour of monopile-soil-systems subjected to extreme loading conditions is analyzed using a finite element model. The focus of the investigations is the quantitative determination of pore water pressure accumulation close to the monopile. 3-D finite element simulations are performed with large diameter monopiles under cyclic lateral, cyclic moment and static vertical loading. The response of monopiles is calculated by a steady state analysis. Because of the symmetry in geometry and load, only a half of soil-pile system is considered, as shown in Figure 7. The monopile with an embedded length l and a diameter d is modelled with 20-node continuum elements. 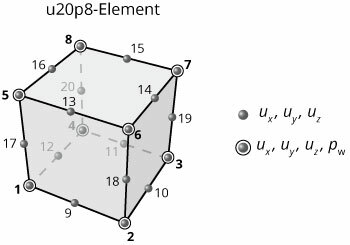 The u20p8 elements are used for modelling the soil. The boundary conditions, which imposed on mesh, are fixing of nodes at the bottom of the mesh against displacement in all directions, on the plane of symmetry against displacement normally on that plane and on the periphery of the mesh against displacement in both horizontal directions. 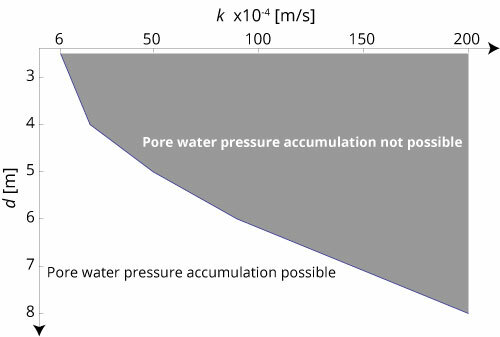 Furthermore non permeable conditions are assumed on all boundaries except boundaries on model surface, where pore pressure due to existing water level must be considered. The frictional behaviour in the interface between monopile and soil is modeled by surface-to-surface contact elements with Coloumb friction law. A linear elastic material behaviour is assumed for the monopile. The material behaviour of sand is described by a hypoplastic model with intergranular strain. The parameters of Berlin Sand are used in model (Taşan et al. 2011). Prior to first phase of the simulation a vertical and a horizontal effective stress as initial loading must be defined for soil to determine the required state variables of hypoplastic model. Therefore, as first a calculation under gravity loading is performed with a coefficient of the at rest value of earth pressure. The static water pressure is also thereby determined. 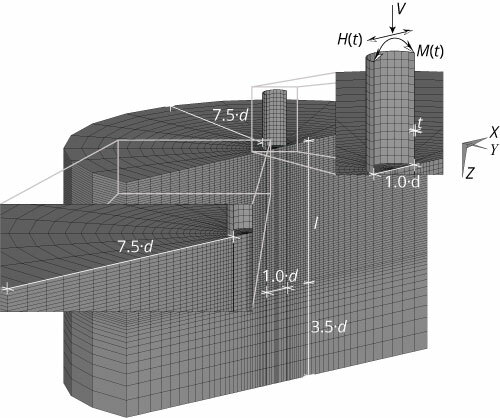 In the following the monopile foundation behavior of an offshore wind energy converter with a rated power of 5 MW in water saturated dense sand is investigated. The focus of the investigation is pore water pressure accumulation in extreme load case close to the monopile. 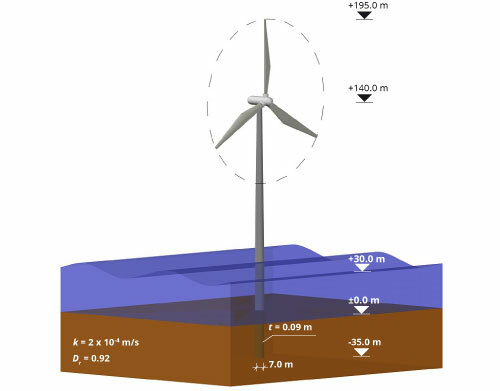 The dimensions of offshore wind energy converter with monopile foundation are shown in Figure 8. The estimated maximum values of the cyclic lateral and moment loads of the monopile at mudline level are shown in Figure 9. 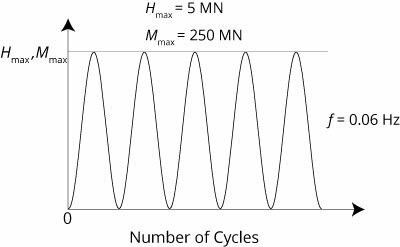 The characteristic of cyclic loads is idealized on the basis of wind and wave loads to study the soil phenomena such as pore water pressure accumulation. Contour plots of pore water pressure ratio Δp/(γ’z), which is defined as a change in pore water pressure with respect to initial vertical effective stress, are shown in the following. The sand in front of the monopile is compacted due to the cyclic loads. As a result the sand volume is reduced and excess pore water pressure develops. At the beginning of loading, opposite to the loading direction the pore volume is increased with the result that the free pore volume is filled with water and as a consequence, negative pore water pressure is determined. With an increasing number of cycles a pore water pressure accumulation is calculated in the loading direction as well as opposite to the loading direction. The radius of maximum pore water pressure ratio simultaneously moves into the direction of the pile base. The cause for development of excess pore water pressure opposite to the loading direction with increasing number of cycles is related to unfavorable drainage and loading conditions. The lateral pile head displacements in dependence of the number of loading cycles resulting from the finite element analysis are shown in Figure 10. For comparison, also the results obtained through the method given in API (2007) and Long & Vanneste (1994) are shown. The p–y method, which is a special subgrade reaction method, is recommended in API (2007) for the design of laterally loaded piles. The p–y curves for different soil conditions are also given in API (2007). A subgrade reaction method with linear increasing subgrade modulus with depth, in which the spring stiffness decreases with the number of load cycles according to the pile installation method, the load characteristic and the relative density of the sand, is proposed in Long & Vanneste (1994). The described method in Long & Vanneste (1994) was suggested based on the analysis of 34 pile experiments in literature. Both methods do not take the possible pore water pressure development due to cyclic loads into account. From Figure 10 it is evident that the pile head displacements are underestimated by the method in API (2007) as well as in Long & Vanneste (1994). An unfavorable drainage in combination with loading conditions caused a pore water pressure accumulation with increasing number of loading cycles which results in progressively increasing pile displacements. Thus the serviceability of the offshore wind energy converter would not be guaranteed. A new criterion for soil-monopile systems is proposed in Taşan (2011). It permits a prediction of pore water pressure accumulation potential during the whole cyclic loading based on the pore water pressure development of the first loading cycle only. Parameter studies are performed with varying monopile diameter and hydraulic conductivity of sand. The results for a dense Berlin Sand with an initial relative density Dr = 0.83 are shown in Figure 11. According to Figure 11 for example, a pore water pressure accumulation is not expected for a cyclic laterally loaded monopile with a diameter d = 2.5 m in sand with a hydraulic conductivity more than k = 6×10-4 m/s. For a monopile with a diameter d = 8.5 m in sand with a hydraulic conductivity up to k = 2×10-2 m/s an accumulation can already take place. The results demonstrate the absolute necessity of considering pore water pressure development for the design of monopiles with large diameter.